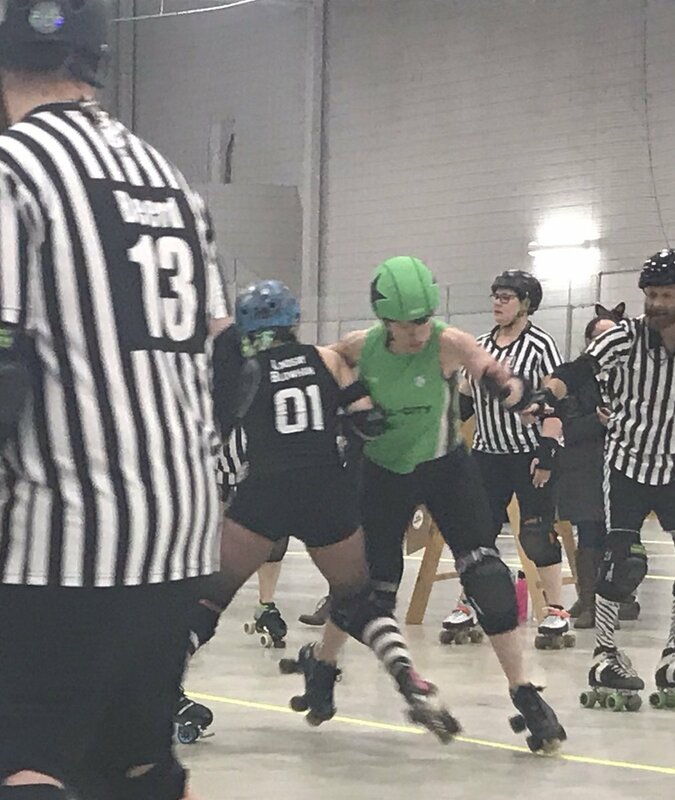 Our Brute Leggers and Rum Rollers were in Grand Rapids, Michigan on March 23rd. The Rum Rollers rolled over Grand Raggidy’s All Stars, winning 276-102. The Brute Leggers won against the Grand Raggidy Attack 152-130. 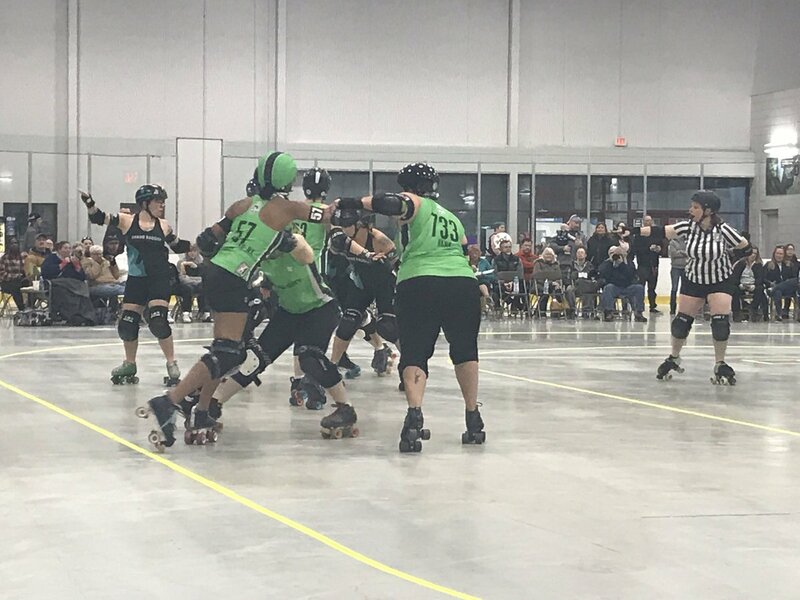 A score that close in any derby bout is a nail biter, and the Brute Legger bout was no exception, coming down to the very last minute. Brute Legger jammers alternated between pushing hard and using their arsenal of strategy and skill. Princess Punch, a fan favourite because of her emoji sign, used brute force in one jam, pushing against her grand opponents for an entire 45 seconds to achieve lead jammer status. 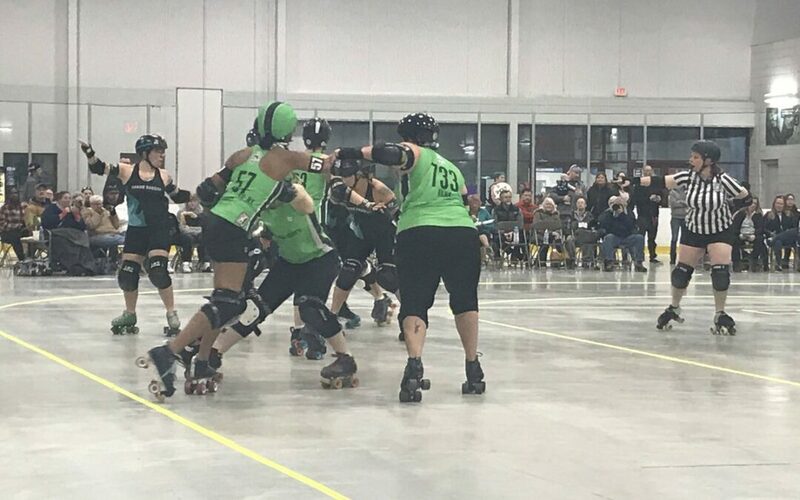 The Brute Legger blockers worked equally hard, demonstrating a devastating defense, staying low and ensuring Grand Raggidy’s jammers made slow progress and had low scoring passes. Tragedy did befall some of the Attack as Tragic Pyro-Ny threw several hits that landed poetically. Tragic Pyro-Ny and Hank preparing to execute a defensive play. MVPs for the Brute Leggers were McPherson for jamming and Rugburn for blocking; Rum Rollers were Pablo Kickasso for jamming and Carpe Deck’Em for blocking. The Brute Leggers will be on their home turf in Guelph on April 13th as they face the Toronto All Stars. Rum Rollers find themselves in yet another tournament in Columbia, South Carolina for Southern Discomfort, April 26th-28th. Their first game on April 26th against Detroit Roller Derby.